Unreleased Demo Recordings for The Band "31st Of February", On Which Gregg and Duane Played As Studio Musicians. Sessions Recorded In September, 1968. Includes An Early Version of "Melissa"
Recorded at TK Studios in Hialeah, FL. Picked this new from the rack in 1972. Having owned and digested IdlewildSouth and Eat a Peach I had to have this. All these years and all over the country this is by my side. To me, Gregs finest ever Blues track, "Nobody Knows You When You're Down And Out." Both of the other two albums have been absconded. I still have this. Playing right now again!! Dr. Amigo is spot on. For ABB aficionados, this is a 'must have' record. Great recording. Duane and younger brother Greg made several tries before finally hitting the big time with their phenomenally successful Allman Brothers Band. This LP represents the last pit stop before that legendary group took shape. On these sessions from 1968, the brothers team for the first time with future ABB drummer Butch Trucks, under the moniker "The 31st of February." Within a few years, they'd be one of the most revered and successful groups of the 70s, and these abandoned tapes would find their way into the hands of cheapo label Bold Records. But despite the low-budget artwork and the cash-in pedegree, it would be a mistake to pass over these recordings, which are excellent in both performance and audio quality. Eight of the nine tracks feature Greg singing lead, and the unmistakable Allman vibe shines through. Among the highlights: A terrific runthrough of Bessie Smith's blues classic "Nobody Knows You When You're Down and Out" and the venerable Bonnie Dobson anthem "Morning Dew." Covered by everyone from Tim Rose and The Grateful Dead to The Jeff Beck Group and Lulu, this version's up there with the best of them. Perhaps of most interest to Allman fans is this early, electric take on the magnificent "Melissa," which they'd re-record years later for their Eat A Peach LP. Years ago, copies of this were common as dirt, and maybe in some quarters still are. But don't be fooled by the quick-buck look of this package. 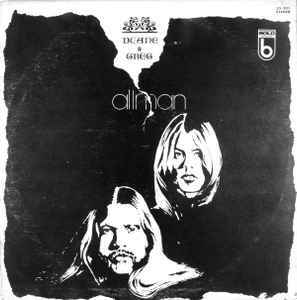 For Allman fans these are essential recordings. There is an alternate gatefold cover that is supposedly a promo. Will try to post picture. This is an alternate cover. Supposedly a promo. Same catalog number.